January 1940. "Family living in a 'crackerbox' slum tenement in Beaver Falls, Pennsylvania." Medium-format nitrate negative by Jack Delano. View full size. Submitted by ida_claire on Thu, 07/14/2011 - 11:27am. This photo is so sweet. I love the little details like the scissors hanging from the dresser, the photo of the happy couple and the purse on the dresser. The detail on the lamp is pretty wonderful too. The baby seems pretty blissful to me. Oh and the "Dad" embroidered on the pillowcase. Submitted by Anonymous Tipster on Fri, 09/24/2010 - 12:37pm. I guess she's the one taking the shot. I love her little handbag behind the dresser lamp. And the "Dad" pillowcase. Submitted by CSK on Tue, 05/19/2009 - 10:18pm. I am a professional classical musician and have noticed that string bass players shift their belt buckles to the side, in order to avoid scratching the finish on the wood in proximity to their bodies. They may or may not be doing that to be "hip". But it works. Submitted by Anonymous Tipster on Wed, 05/13/2009 - 11:41pm. My Gramps wore his that way until he died a few years back. My grandmother says it was cool in the 30's. He couldn't let that fad go; maybe he was waiting for it to come back in style. Submitted by jbart on Wed, 05/13/2009 - 6:44pm. It appears that the man, reflected in the mirror, has his belt buckle aligned on his side rather than in front above the zipper. What gives. Submitted by Julie Birmingham on Wed, 05/13/2009 - 6:02pm. Submitted by Bull City Boy on Wed, 05/13/2009 - 7:51am. You know that sleeping on that mattress had to be utter torture. Submitted by Anonymous Tipster on Tue, 05/12/2009 - 9:15pm. Joe Willie Namath was born there in 1943! Submitted by Flababo on Tue, 05/12/2009 - 8:30pm. The door likely led to another apartment. A lot of houses were subdivided later into apartments and rather than removing the old doorway, the landlord simply nailed it shut. I used to live in single family home converted into a duplex and a good many once-useful doors to the other half of the house were latched/nailed/boarded shut. Submitted by Anonymous Tipster on Tue, 05/12/2009 - 7:26pm. That is one limp-looking baby. At first I thought it was a big doll. Submitted by toffle on Tue, 05/12/2009 - 6:36pm. "And here I have lamely related to you the uneventful chronicle of two foolish children in a flat who most unwisely sacrificed for each other the greatest treasures of their house. But in a last word to the wise of these days let it be said that of all who give gifts these two were the wisest. Of all who give and receive gifts, such as they are wisest. Everywhere they are wisest. They are the magi." Submitted by Anonymous Tipster on Tue, 05/12/2009 - 12:49pm. These people owned a very nice "collectible of the future" -- an early 20th century Heintz Art Metal lamp, made by Otto Heintz of Buffalo, of dark bronze with sterling onlays. These are very sought after by collectors of Craftsman style furnishings, and nowadays usually sell for several hundred dollars, unless some eager beaver has polished the bronze. Below is a similar lamp. Submitted by Paco on Tue, 05/12/2009 - 11:36am. Por la traza de las sombras se aprecia que la luz procede de un punto interior de la habitación. Probablemente de un foco eléctrico o un flash, quizás de magnesio. La luz natural disponible en el interior, seguramente, habría reflejado una imagen más sombría y aún más deprimente. Submitted by Eponymous Tummler on Tue, 05/12/2009 - 11:33am. The finial over the mirror is missing. I bought a similar dresser at a yard sale years ago. The top part kept falling off. Submitted by Anonymous Tipster on Tue, 05/12/2009 - 10:59am. This might have been a room for rent. Submitted by Anonymous Tipster on Tue, 05/12/2009 - 10:53am. I didn't realize that was a baby until I looked at the photo full sized. The guardian angel on the crib made me choke up. Submitted by Anonymous Tipster on Tue, 05/12/2009 - 10:40am. I'm curious about the door behind the bed. It's latched and nailed shut. Submitted by David Campbell on Tue, 05/12/2009 - 7:49am. Despite the family's desperate situation there are clues of a happy life framed in this shot. They are safe and warm from the snow storm seen through the window. Their child's dolls are nearby. On the dresser is a treasured portrait of a smiling young couple who are obviously in love. 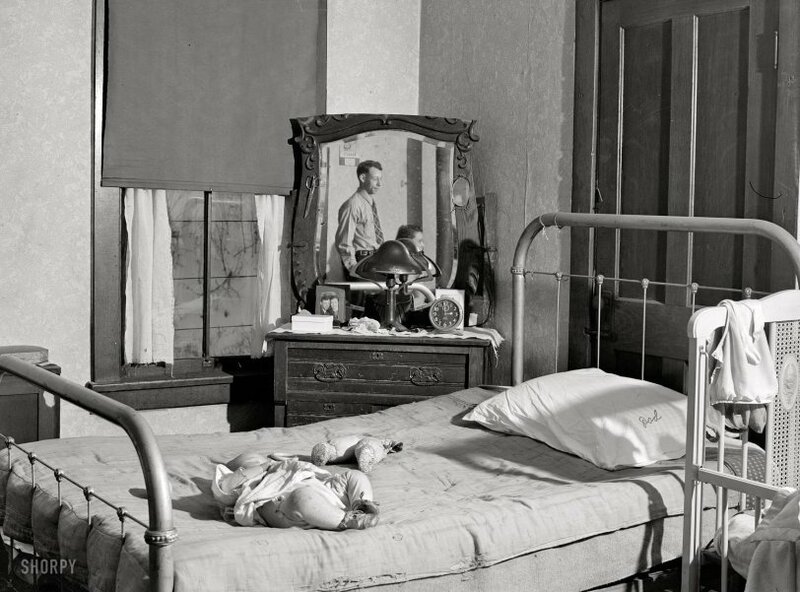 Despite the conditions they find themselves, the mirror reveals them smiling as they look over toward their child in the crib. This is a loving family that will survive their circumstances. Submitted by allie on Tue, 05/12/2009 - 7:43am. I remember those embroidered pillowcases. I bet Dad usually woke up with the word "Dad" imprinted on his forehead. Submitted by Anonymous Tipster on Tue, 05/12/2009 - 7:27am. The people reflected in the mirror don't seem like they are very close to being down and out, although looks can be deceiving. At least they seem to have retained their dignity. And what the heck is a "crackerbox slum tenement" anyway? I lived not far from Beaver Falls, at the little river town of Beaver on the north bank of the Ohio, back in the summer of 1956. It was one of the nicest little towns I've ever lived in, although you had to go across the Beaver River on the bridge to Rochester to buy a beer or see a movie. Submitted by Mr Mel on Tue, 05/12/2009 - 6:32am. And I thought those camping trailers were small. Submitted by Anonymous Tipster on Tue, 05/12/2009 - 4:40am. Hey - at least this was the exception, in the US. "By 1965, 38% of houses in Glasgow had no fixed toilet or shower. Submitted by Anonymous Tipster on Tue, 05/12/2009 - 12:22am. I'm now thoroughly depressed. Can we please get back to those nice scantily clad swimsuit models now?